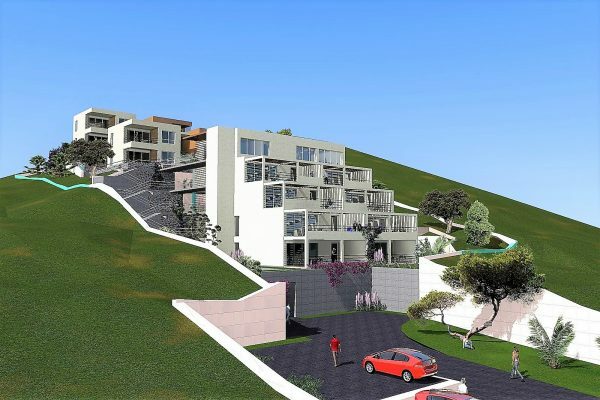 TG1400 – A three-bedroom apartment for sale Trogir, tastefully furnished with amazing views, on elevated area, walking distance to the city of Trogir. This lovely apartment for sale Trogir offers beautiful views from its south-facing loggia. It features an entrance area, three double-bed bedrooms, a spacious bathroom fitted with a bath tub, a bidet, wash basin, toilet and a washing machine, an additional separate toilet, a very practical pantry, a lovely L-shaped kitchen fitted with all the necessary equipment (dishwasher included). Right in front of the kitchen there is a dining area with a table that seats six. On the side there is a living space with a sofa and two armchairs and a coffee table. By the window there is a desk. The size of the interior space is a bit over 90m2. The living/dining area opens to a loggia and this loggia is about 14m2. There is plenty of room for a large dining table and perhaps a lounge chair. From here you can enjoy attractive views of the laguna and better part of the sunset. There is no parking allocated for this unit but in this area finding parking is not an issue. The property is set in a well-maintained building which is only minutes away from Trogir old town offering a nice choice of excellent restaurants, cafes and bars. On this small island which houses Trogir, there is an extraordinary number of churches and towers, ancient palaces, as well as a citadel Kamerlengo dating from 15th century. In 1997 Trogir was inscribed in the UNESCO World Heritage List. From Trogir you can easily make day trips to many attractive destinations. Besides proximity to Trogir, this apartment is also not far from the long pebbles beach of Okrug Gornji. The beach is facing west, dotted with numerous cafes, very vivacious and vibrant.